This 17" x 21" oil on canvas is my personal favourite out of all my artworks. 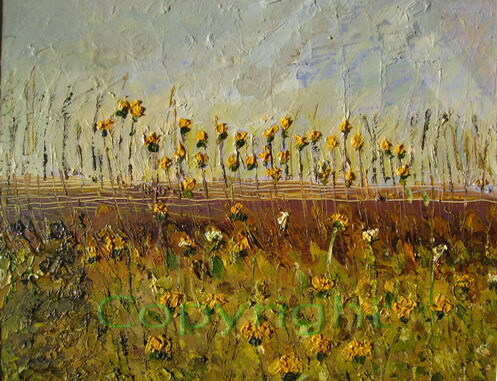 It brings alive the whole field through multiple layering of the sky and the foreground - it has a certain 3D effect due to the use of my palette knife and the ambience is divine. I like the texture in this. It is very satisfying painting with a knife. I particularly like your wildflowers and grasses. Also, the way you have given depth by scratching the background field. Very well done. Lovely, nice blend of color and the paint has a good 3d look to it.